IS JOE BIDEN TOO OLD TO RUN FOR PRESIDENT? Joe Biden admits age would be an issue in presidential bid. 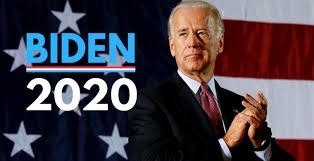 Democratic former US vice president Joe Biden has conceded that his advanced years would be an issue if he ran for president in 2020. At 75, Biden is three years older than Republican President Donald Trump and would be 77 by the time his party's primary contest got underway. "I think age is a totally legitimate thing to raise," said Biden, who was vice president under Barack Obama, during a speech in Michigan on Tuesday, Oct. 16, 2018..
"It's totally appropriate for people to look at me and say if I were to run for office again, 'Well God darn you're old,'" he said in remarks carried by CNN television. "Well, chronologically I am old." The Book of Joe: The Life, Wit, and (Sometimes Accidental) Wisdom of Joe BidenThe aviators. The Amtrak. The ice cream cones. The memes. Few politicians are as iconic, or as beloved, as Joe Biden. Now, in The Book of Joe, Biden fans will finally have the definitive look at America's favorite vice president—and what he can teach us. Structured around key moments in Biden's life and career—and filled with Biden-isms like "That's a bunch of malarkey" and "I may be Irish, but I'm not stupid"—this blend of biography, advice, and humor will reveal the experiences that forged Joe Biden, and the lessons we can use in our own lives. Along the way, readers will also encounter fun sidebars on his love of muscle cars, his most endearing gaffes, his bromance with President Obama, and much more. Yet beneath the memorable Biden-isms, the book will reveal an inspirational story of a man who keeps "getting back up." We need this right now. Much as Biden has come back from both professional missteps and personal heartbreaks, sometimes we all have to get back up and fight. Given Biden's reputation as a decent, plainspoken, patriotic statesman of integrity, this entertaining and practical book will be both a celebration of great political figure and an essential guide to creating the America he believes in so dearly. Direct Link to book: https://click.linksynergy.com/link?id=w2VGpneWfTE&offerid=189673.11960341388&type=2&murl=http%3A%2F%2Fwww.alibris.com%2Fsearch%2Fbooks%2Fisbn%2F9780525572589 .